We're a family that likes to play outside -- even in the god-awful Texas summer. Most evenings you can find us in the 'sport court' (aka, our driveway). Playing soccer, basketball, t-ball, diggin' in the dirt to make monster truck courses, you name it, we're out there. As far as Texas front yards go, we're pretty lucky. Ours faces east and our swing-entry garage is on the south side, which means the driveway's not baking in the sun all day. The down side is mosquitoes. And I'm talkin' TEXAS-size mosquitoes ('cuz EVERYthing's bigger here in the Lone Star State, ya know.) And don't get me started on West Nile...the friend of a friend of the 5th cousin thrice removed of my next-door-neighbor's brother-in-law's cousin had a co-worker's daughter's friend who...well...you get the picture. I can spin you a Texas-sized tale about what a threat mosquitoes are! Anyway...back to bugs. The problem with playing outside in the evening is bugs, of course. Everybody knows that. And bugs love ME. Nobody ever worries about getting bitten up when I'm around, because every bug in the neighborhood is chomping on me. But last summer, I found the perfect insect repellent, my daughter, Delila. Poor little girl. A little over 1-year-old, tottering around in the drive way...within 5 minutes she'd be covered with dime-sized welts. Breaks my heart just to think about it. She was so little, I really hated the idea of spraying chemicals all over her -- and I couldn't force her to stay inside. What was a mom to do? Citronella Grass -- the origin of the oil used in all those patio candles. Well, that wasn't going to work for me since it needs plenty of sun and grows to be 6' tall. The HOA would just love that. NEXT! Catnip -- yep, mosquitoes are happy to 'just say NO' to the kitty drugs. However, my indoor-only cats really frowned upon the idea of opening an outdoor drug den for all the neighborhood felines. NEXT! Rosemary -- NOW we're talking. Who doesn't love rosemary? It smells great, you can cook with it AND it'll send the mosquitoes packing? Unfortunately, rosemary needs a little more sun that my front yard has to offer. NEXT! Marigolds -- can you believe it? Apparently, marigolds have a smell that many insects find objectionable. Too bad a lot of humans find the smell objectionable as well. Not exactly what I want at my front door. NEXT! I wasn't having any luck in the gardening department, so I started looking at essential oils. I already had a growing collection of ingredients. Surely there was something there I could use. Sure enough! There are plenty of aromatic oils that are effective at warding off biting bugs: eucalyptus, tea tree, peppermint, lavender, geranium, patchouli. The list is actually quite long. So, into my 'lab' I went. I started mixing things up and using my daughter as a guinea pig. In the end, I came up with my Bzzz Off! formulation. I was amazed at how well it worked! 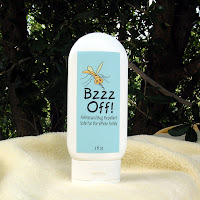 Bug season's almost here and you know what I'll be saying to all those pesky mosquitoes.... Bzzz Off!! Oh, and did I mention that it's maternity and baby-safe? !